Home » How to convert MTS to FLV, F4V and SWF format for uploading to Internet? Basically, it is necessary for Camcorder holders to do some extra work before uploading the footages to internet for sharing, since most HD Camcorders, especially Sony AVCHD Camcorders, produce footages in MTS/M2TS format, which would be high-definition but not an acceptable format for online video streaming. 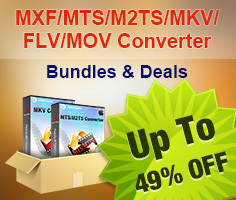 In that case, you need convert the MTS/M2TS recordings to some acceptable formats, i.e, FLV, F4V and SWF. 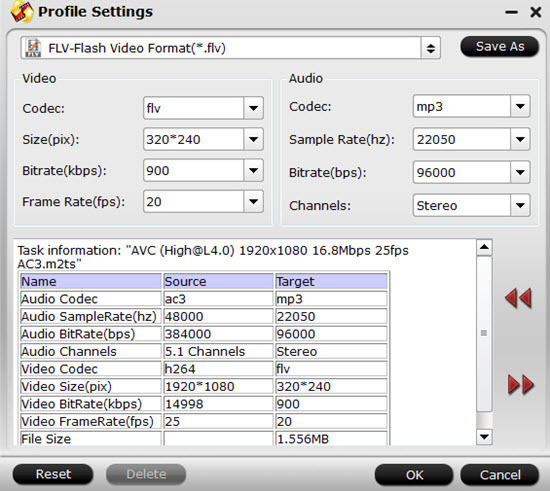 FLV files can play on any of the Flash Player versions noted above, while F4V files can only be played with Flash Players 9 (v3) and 10. All of these files can also be played on Adobe Media Player, which itself runs on the Adobe Integrated Runtime (AIR) platform. SWF files can be played back using Flash Player, and SWF files primarily play through the Flash Player web browser plug-in. 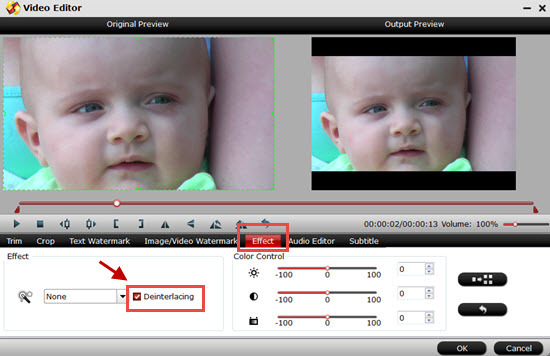 Here's a look at how to convert MTS video clips to FLV, F4V or SWF for upload. Required Software- Pavtube Video Converter. Note this is a trial version and will add watermark in the middle of the screen. To convert video clips free from watermark, please purchase the full version. How to transcode AVCHD MTS videos into FLV, F4V, SWF for net uploading? 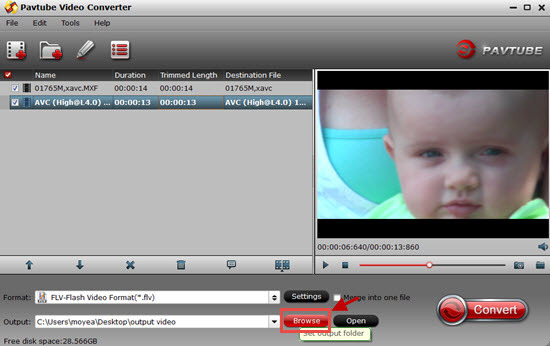 Import AVCHD MTS/M2TS footages to the app through "Add Video" button or "Add from folder" icon. Click 'Format' bar to set output format. There are various video and audio formats to choose from. 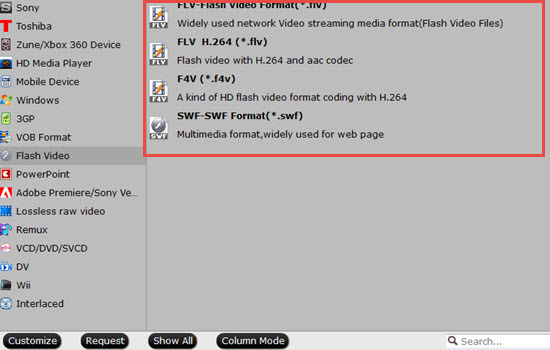 As for Flash Video, there are three formats available, FLV, F4V and SWF. Some sites accept FLV formats and some others prefer SWF files, please make sure which format is right for you. Step 3. Then click 'Settings' and customize advanced audio and video parameters such as size, frame rate, bitrate, etc. Generally speaking, most video hosting sites take 320*240pix as standard size for uploading. If the generated files are too big for upload, you can cut the size down by setting a smaller video bitrate. Camcorders may record video up to 60fps, which will not fit for flash files. Recommended frame rates are 20fps, 15fps and 12fps. Step 4. Click the "Browse" icon next to Output bar to specify a location for saving the converted flash files. The converter supports batch conversion and will convert all the selected files in file list once you click 'Convert'. You could select "Shut down computer after conversion" when the progress panel pops up. After conversion, simply click the "Open" button next to output path to get the generated Flash Videos for uploaded and sharing. Enjoy your experience with Pavtube MTS to Flash Video Converter! How to De-interlace, Trim and Merge MTS videos when encoding MTS to FLV/F4V/SWF? By default the Video Converter will apply de-interlacing facility to all the MTS clips that are interlaced. If you're using an older version, just click "Edit" to enter the video editor, switch to "Effect" tab, and check the "Deinterlacing" box. Basically, video hosting sites restrict video clips to be in certain file size and length. For instance, YouTube stated that "videos can be up to 2GB in size and 10 minutes long". 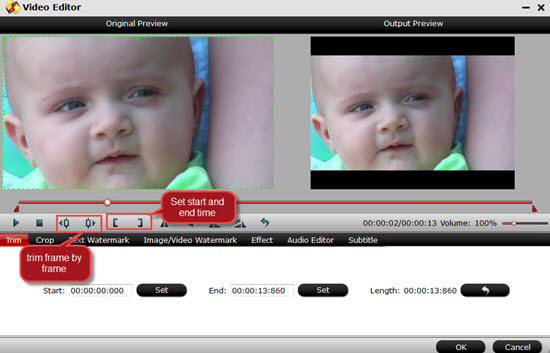 You can trim the video to desired length with the Pavtube HD Video Converter. Simply click 'Edit' menu-> 'Trim' tab and set start and end time point. To join multiple MTS together, just select them in file list, and tick off the checkbox "Merge into one file" on the main interface. The Video Converter also handles video shootings captured by a number of different Hard-drive-based camcorders like Canon HFS21, HFS200, HFS20,HFS10, HFS11, HFS100, HFM300, EOS 7D, EOS 550D, EOS 500D, EOS-1D Mark IV, etc. If you want to know more about how to edit, play, DVD burning about AVCHD (MTS) files, you can go to this AVCHD Page. To maintain the most quality of your videos, H.265/HEVC or H.264 high profile are both good choice.